With some respite from incessant rain lashing the state, 39 tourists, including 26 foreigners stranded in the Sangla valley in Kinnuar, were evacuated by a helicopter. Though heavy rain might have caused extensive damage to roads and other infrastructure, it is proving a boon for agriculture with the state heading for a record kharif production. The hearing of the petition filed by Union Steel Minister Virbhadra Singh seeking transfer of the audio CD case to the CBI could not be completed before the high court today. The matter was listed before the bench comprising Chief Justice Kurian Joseph and Justice Deepak Gupta. After hearing both parties, the bench adjourned the hearing of this case for Monday. The three-member committee constituted by the state government started its inquiry into the education scam today. Seven labourers were injured, three of them seriously, in a furnace blast at KC Alloys, a steel manufacturing unit, in Kandrori village of Kangra district today. Those critically injured include Manmohan Singh, Rajvinder Singh and Swati Lal, residents of Nepal. They have been admitted to Ravi Hospital at Pathankot. The two major employee organisations, the Himachal Non-Gazetted Services Federation and the HP Employees Confederation, today joined hands to put pressure on the government for acceptance of their demands. The 15th state-level Primary School Students’ Sports Meet was inaugurated on the Dhalpur ground here today by MLA and State BJP president Khimi Ram Sharma . Sharma said the students could showcase their skills if such meets were organised. The Enforcement Directorate (ED) has sought details regarding five alleged benami properties of Tibetans in Kangra district. The election of the High Court Bar Association was held here today, in which Ashok Sharma was elected the president of the Bar Association. Vishal Panwar was elected the vice-president and Kush Sharma the secretary of the association. About 120 tourists had been stranded in the Sangla valley with the main roadlink via Karcham being blocked due to heavy landslides at various places for the past five days. A district official said out of the 39 evacuated, 26 were foreigners while the remaining 13 were from West Bengal. He said about 80 more tourists were still stranded in Sangla. It was owing to bad weather late in the afternoon that the chopper had to suspend rescue operations. In case the weather improved, efforts would be made to evacuate the remaining tourists. While some of the tourists, including some who had taken ill, were dropped at Rekong Peo, others were dropped in Shimla. 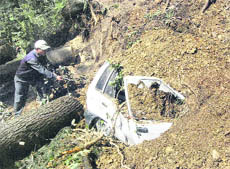 Officials said efforts were on to get the road connecting Sangla and Karcham cleared as both PWD and labourers of JP company were at work. The district administration had made arrangements for treatment and medicines for the sick tourists, a majority of whom were lodged in hotels. Even though the main roads connecting Shimla with Jubbal, Rohru and Rampur are cleared, most of the link roads are still in a bad shape with vehicular movement still not being restored. This is hampering transportation of apple from orchards as growers are facing a lot of inconvenience. With the Meteorological Centre indicating dry weather and clear sky in the low hills, the rains could finally be on their way out. However, there could be rain at isolated places in the middle and high hills of the state during the next two days. Farmers, who were reeling under the impact of three successive crop failures, have something to cheer at last. The state will be achieving the kharif target of 9.37 lakh tonne, including 7.80 lakh tonne of maize and 1.50 lakh tonne of paddy, for the first time. Last season, when the region experienced a poor monsoon, the production was only 6.55 lakh tonne against the target of 9.20 lakh tonne. Lack of rain during winter severely affected the rabi crop and the production was only 4.50 lakh tonne as against the target of 7.25 lakh tonne. The impact of unfavourable weather conditions is more severe in the hill state as almost 80 per cent of the cultivated area is rain-fed and the farmers are dependent on the rains. “Normally, the monsoon is over by the first week of September and harvesting of maize starts by the middle of the month. The protracted monsoon caused some damage to maturing crops, almost 15 to 20 per cent in some pockets in lower areas of the state, affecting production”, points out Director of agriculture J.C.Rana. However, the excessive rains took a toll on vegetable crops, particularly tomato and capsicum, which suffered much damage in Solan, Shimla and Kullu districts. The harvesting season which is extended up to mid-October has been shortened and as a result, the vegetable production during the season is likely to be only 5.50 lakh tonne as against the expected 6.50 lakh tonne. The beneficial impact of the excessive rains will be felt even in the coming rabi season as the overstretched monsoon has ensured that there will be enough moisture in soil for timely sowing, which commences from October 15. The last two rabi crops failed due to the prolonged dry spells which affected sowing. The committee, headed by director industries Omkar Sharma, issued an appeal to public to provide any kind of information regarding the scam to it. The identity of those revealing information would be kept secret, he said. Later, while talking to TNS, Sharma said: “Our basic objective is to find out loopholes in the education board system that led to scam. We have asked the board authorities to provide us the details of system of allotment of roll numbers, examination centres, procedure of secrecy branch and preparation of results. Other members of the committee are joint director college Yogesh and deputy director elementary education Dharamsala Satish Dhiman. Meanwhile, the police arrested two more postmen, Mukesh posted at Gurkeri and Swaroop Singh posted at Tiara yesterday. Sources said during interrogation the postmen had admitted that they used to deliver registered post to an aide of main accused Kashmir Singh, a teacher in a private school. Seven labourers were injured, three of them seriously, in a furnace blast at KC Alloys, a steel manufacturing unit, in Kandrori village of Kangra district today. Those critically injured include Manmohan Singh, Rajvinder Singh and Swati Lal, residents of Nepal. They have been admitted to Ravi Hospital at Pathankot. 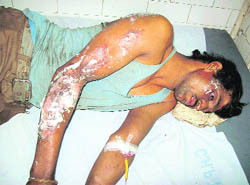 Other labourers received minor burns and have been admitted to a local hospital. Most injured were Nepalese who were working in the unit. Sources told The Tribune that the blast occurred when a labourer put some scrap in the furnace. The scrap containing some explosive substance exploded and spread the melted iron in the surrounding areas causing injuries to other labourers. Kandrori is located near the firing ranges of the Army. Scrap dealers collect shells of explosive from the firing ranges. Earlier also, blasts had occurred in the area, even on the premises of scrap dealers. But no mechanism has been evolved so far to check the supply of explosive shells to scrap dealers. Sources said the ED had sought ownership details of Nyimgmapa Centre and Dip Tasecholing Celukpa Monastery at McLeodganj, Gyuto Tantric University at Sidhbari, Jamyang Choeling Nunnery and Shugsup Nunnery at Garoh near here. It has also asked for details regarding the action taken by Kangra revenue authorities in this regard. They also sought the status of properties of TSR Monastery in the Trilokpur area of Kangra district in the name of Sewa Devi Negi, a resident of Himachal Pradesh. The ED is mainly concerned with enforcement of provisions of the Foreign Exchange Regulation Act, 1973. The sources said the ED had traced the source of money used to create one of these properties, to China. The money was routed from China to Bangkok from where it went to the US and reached India. Deputy Director, ED at Chandigarh Zonal office, V Neeraja said the EDwas inquiring into these properties. She, however, said the inquiry had been going on for the past two years and was also being conducted by the income tax authorities. So far, it has only been found that most properties where the Tibetan institutions have been set up, are in the name of Himachal residents. Inder Sharma was elected the treasurer of the Bar Association. Ashok Kumar has been elected as the president for the third time.